A Rehab dobozok nagyon jól néznek ki, a kedvenceim, mert ütős a design és több ízben is kapható. Olyan sejtésem van, mivel az Absolutely Zero doboz már előbb a piacon volt, így kicsit onnan vették a doboz kinézetének az ötletét. Sok gyűjtőtől hallani ranglistát, hogy melyik jobb és melyik rosszabb. Én is felállítok majd egy ranglistát. A Green Tea is szénsavmentes, mint az összes Rehab. Ezt én nagyon kedvelem, mert nem szeretem a tudatot, amikor a szénsav károsítja a fogaimat. A Rehydratáló anyagok miatt nagyon kellemesen csúszik le a doboz tartalma, és eszméletlenül finom. Aki csak teheti, próbálja egyszer megkóstolni, mert nagyon megéri! EN This is one of the original US Rehab. I'm lucky, because I found a shop nearly, where they sell US Monsters and energy drinks from England. For me, the monster collection point of view and taste point of view mean a lot. In Hungary, my Monster collection are not the biggest, but I have lot of rare and super rare Monster cans in my collection, and this make my collection exclusive. The Rehab cans look very well, my favourites, because the design and more flavour s available. In my opinion, the design of the Rehab cans looks like the Absolutely Zero, what there was before than the Rehab cans, and they copied some ideas from that can. To be audible from many collectors ranking, that which right and which badder one. I set up a ranking too then. 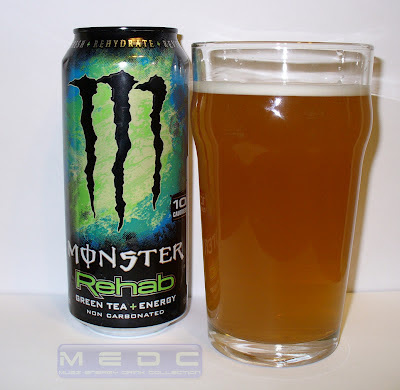 The Green Tea is non carbonated too, like the all Rehab cans. The smalls of the can is pleasent, like green tea Nestea... The smell is similar to green teas, that's why it is called to Green Tea. His flavour has a very pleasant, silky feeling, and not the flavour of mild green tea is only, but exceptionally intensive! The can have 4% fruit content. Ingredients: Green Tea extraxt, Black Tea extract, Rooibos tea extract. Because of the Rehydrate substances Rehydratáló the content of the box slides down very pleasantly because of substances, and unconsciously it's good. If you can do it, try this Rehab can.